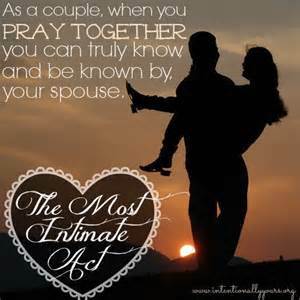 Couples who pray together have their relationship enriched and strengthened. US surveys show that while the divorce rate for Christians is not really less than for those outside the church, Christian couples who pray together have a divorce rate of less than 1%. Our personal lives benefit from a living relationship with Christ through the Holy Spirit. So it is also with our married lives. Building a foundation of prayer within a marriage strengthens it, brings the power of prayer into a marriage and allows God to work together with the couple. In the book of Ecclesiastes we read "A cord of three strands is not easily broken" (Ecc 4:12), and adding God into a marriage strengthens it and protects it. We can pray together issues that we face, bringing them together to God rather than trying to solve them alone. Praying together will build trust between partners, allowing issues and joy to be shared openly. Keep Christ at the centre of the marriage, allowing his protection, healing and forgiveness where necessary. For these and many other reasons, prayer is an essential part of a healthy marriage. Find the right time and place to pray together. For some, that may be last thing at night, but if you have different sleep patterns, you may need to find a different time. Once you've found the best time make an appointment with each other in your diaries. Do talk about your prayer needs. You may want to pray about issues affecting one of you, about issues facing your children or other loved ones, future direction etc. However, don't go for an in-depth discussion, since the prayer time can quickly become overtaken. You will need to become comfortable with one another's differing prayer styles. Remember, no one style is "better" than another. Also practice listening prayer, being comfortable with silences during your prayer time that enable you to listen to what God may want to say to you. You may find a structured pattern for prayer helpful: either the informal structure led by one or both of you, or a more structured pattern such as using a Catholic devotional booklet. But do allow yourselves the flexibility to pray openly and freely about the issues of the day. Do persevere - this may be an aspect of marriage that will take a while for you to feel comfortable. But as you persevere, you are strengthened and blessed by the God who brought you together and who cares for you. We thank you, O God, for the Love You have implanted in our hearts. May it inspire us to be kind in our words, considerate of feeling, and concerned for each other's needs and wishes. Help us to be understanding and forgiving of human weaknesses and failings. Increase our faith and trust in You and may Your Prudence guide our life and love. Bless our Marriage O God, with Peace and Happiness, and make our love fruitful for Your glory and our Joy both here and in eternity. Grant that I and my spouse may have a true love for each other. and that we may be filled with faith and trust. Give us the grace to live with each other in peace and harmony. May we always bear with one another’s weaknesses and grow from each other ’s strengths. Help us to forgive one another’s failings, and grant us patience, kindness, cheerfulness, and the spirit of placing the well-being of one another ahead of self. May the love that brought us together grow and mature with each passing year. Bring us both ever closer to you through our love for each other. Let our love grow to perfection.